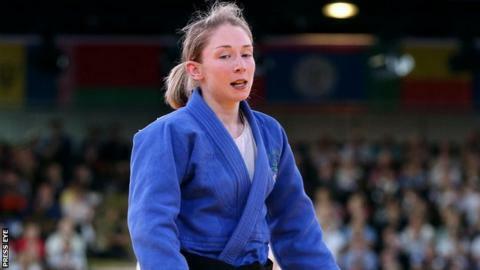 Lisa Kearney's hopes of competing in the Rio 2016 Olympic Games appear to be over after the Belfast judoka suffered a serious knee injury in training. The 25-year-old is expected to undergo surgery on the knee ligament problem next week and could be ruled out of action for a around a year. Kearney fought in the 48kg division for Ireland at London 2012, losing in the round of 32. She won bronze in the -52kg category at last year's Glasgow Commonwealth Games. Kearney, coached by Ciaran Ward, recently won bronze at the IJF Grand Prix in Samsun, Turkey, an Olympic qualification event and had been producing some of the best performances of her career to date. The Irish Olympian will also miss the European Games in Baku, with her rehabilitation being directed by the Sports Institute NI. Qualification for judo at the Olympics is based on the IJF's world ranking, where Kearney would have to earn a place in the top 14 of her weight category by May next year to make Rio. "Unfortunately due to a bad knee injury my quest for Rio has come to a premature and abrupt end," Kearney tweeted on Friday. "Thanks to everyone for the messages of support. The road to recovery will be long but with an amazing team behind me I have no doubt I will recover," she added. Belfast competitor Lisa Kearney secured a gold medal at the Oceania Open in Woollongong, Australia on Friday. The 25-year-old, who won a bronze at the Commonwealth Games in July, also gained qualifying points for the Rio Olympics with her victory. Kearney missed out on a medal at the 2012 Olympic Games in London but won bronze in Glasgow in the summer. The local judoka forced a submission to defeat Canadian Audree Francis-Methot and earn the medal.